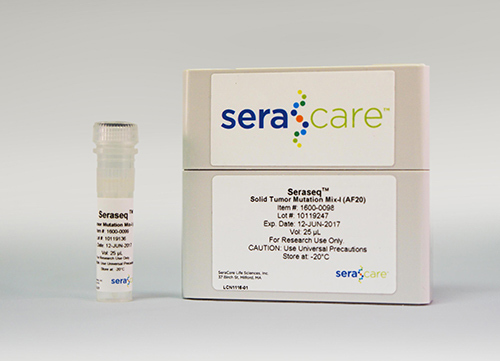 The Seraseq™ Solid Tumor Mutation Mix Mix-I (AF20) is a biosynthetic reference material designed to evaluate the performance of next-generation sequencing (NGS) based tumor profiling assays. This product contains specific engineered mutations in a wild-type background of well-characterized genomic DNA, a mixture of mutations in key oncogenes and tumor suppressor genes, and is compatible with all major cancer hotspot oncology panels and NGS platforms on the market today. In addition, it permits laboratories to monitor library preparation, sequencing and variant allele detection under a given set of bioinformatics pipeline or parameters. It is currently for research use only.